Living a Fit and Full Life: Enjoy Bedtime with the 5-Minute Bible with 100 Stories & 100 Songs By Stephen Elkins! 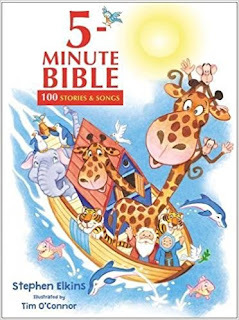 Enjoy Bedtime with the 5-Minute Bible with 100 Stories & 100 Songs By Stephen Elkins! From Moses’ encounter with the burning bush and Jonah’s trip to Nineveh to Jesus’ parable of the prodigal son and the last supper, 5 Minute Bible: 100 Stories and Songs will make an eternal difference by revealing God’s amazing love. With biblical truths and life-action applications, your child will take these biblical teachings to heart, and the adorable illustrations and song lyrics will help make these five minutes the best part of the day. Enjoy bedtime with the 5-Minute Bible with 100 Stories & 100 Songs By Stephen Elkins! I absolutely love this book because it allows my family to always have time for a quick bedtime story or song since they're only 5 minutes long. The illustrations are fun and my kids absolutely love them! The song lyrics are incredibly fun and such a fun way to end the day together. 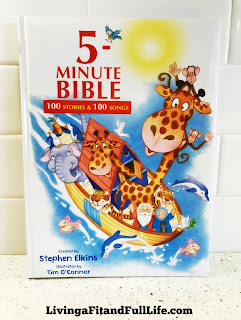 If you're looking for a fun way to keep the focus on God at bedtime or any other time of day 5-Minute Bible with 100 Stories & 100 Songs By Stephen Elkins is the perfect way to do it! You can find 5-Minute Bible By Stephen Elkins on Amazon, Barnes and Noble and at other bookstores.